The WEIBULL.DIST function is categorized under Statistical functionsFunctionsList of the most important Excel functions for financial analysts. This cheat sheet covers 100s of functions that are critical to know as an Excel analyst. It will return the Weibull distribution for a supplied set of parameters. 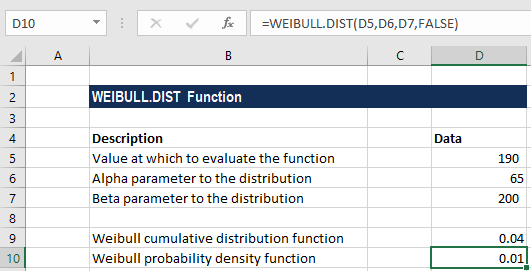 This guide to Excel Weibull distribution will how you have to use it step-by-step. Introduced in MS Excel 2010, the WEIBULL.DIST function is the updated version of the WEIBULL function. X (required argument) – It is the value at which the function is to be calculated. It must be greater than or equal to zero. Alpha (required argument) – It is a parameter to the distribution. It is the Shape parameter to the distribution. It must be greater than 0. Beta (required argument) – It is the scale parameter to the distribution and it must be greater than 0. Cumulative (required argument) – It is a logical argument denoting the type of distribution to be used, which can either be TRUE (Weibull Cumulative Distribution Function) or FALSE (Weibull Probability Density Function). Where x is the independent variable, α is the shape parameter, and β is the scale parameter. How to use Excel WEIBULL DIST Function in Excel? #VALUE! error – Occurs when x, alpha, or beta values provided are non-numeric. When the given value of alpha or beta argument is less than or equal to 0.